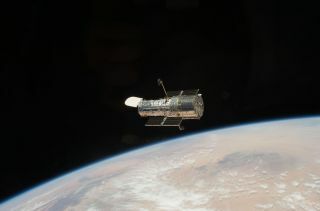 The Hubble Space Telescope, an icon of astronomy, is seen in orbit in May 2009 by the crew of NASA's STS-125 mission. The space telescope is the star of Hubble@25, a new exhibit at the Intrepid Sea, Air and Space Museum in New York City. NEW YORK -- Over the last quarter-century, the Hubble Space Telescope's breathtaking images of galaxies, gas clouds and nebulas have captured the public's collective imagination, and vastly increased scientists' understanding of the universe. In April 2015, the Hubble Space Telescope will celebrate 25 years in space and a lasting astronomical legacy that began with its launch in 1990. That legacy takes center stage in "Hubble@25," a new exhibit here at the Intrepid Sea, Air and Space Museum that opened in October. To mark Hubble's impending milestone, the last astronauts to visit the orbiting observatory recalled their mission and how the space telescope has changed the face of astronomy. The Hubble Space Telescope takes center stage in the Hubble@25 exhibit at New York City's Intrepid Sea, Air and Space Museum. The Hubble Telescope will celebrate its 25th anniversary in April 2015. Six of the seven crew members of STS-125 (l to r): mission specialists Michael Massimino, Michael Good, and Megan McArthur Behnken; Pilot Gregory C. Johnson; mission specialist John Grunsfeld; commander Scott D. Altman. Good joined five of his six crewmates from STS-125 at the Intrepid for a panel discussion celebrating Hubble's 25th anniversary. Speaking to a packed auditorium were astronauts Scott D. Altman, Gregory Carl Johnson, Mike Massimino, Megan McArthur Behnken and John Grunsfeld (the seventh STS-125 crewmember Andrew J. Feustel was not in attendance). According to Susan Marenoff-Zausner, president of the Intrepid Museum, this was the first time the crew had spoken publicly together since the mission. News anchor Charles Gibson moderated the discussion among the six astronauts. The crew spoke about preparing for space, whether they would return if given the chance and, of course, about Hubble. "[Hubble] has given us a perspective on our place in the universe that I don't think we had before," said Altman, who served as commander of STS-125. "Fifteen-hundred galaxies in one soda straw view of the night sky. Billions of stars in each one. You realize: This is a big place." Hubble was the first major optical telescope put into orbit above the Earth's atmosphere. By removing the planet's atmosphere from the telescope's line of sight, astronomers were able to see fainter sources of light, with better focus, than they could with telescopes on the ground. "The telescope was designed to answer specific questions about unlocking the mysteries of the universe … but some of the biggest discoveries from the telescope were things that we weren't even smart enough to ask the question," McArthur Behnken said. "So for me … that is what's so wonderful about the telescope. It has extended our ability to explore the universe in a way that we were not even smart enough to know [was a possibility] before we did it." The STS-125 crew had IMAX cameras on board during the mission, which they used to make "home movies" as Massimino called them. The footage was used in a documentary called "Hubble 3D," which recorded the many problems the crew faced in trying to repair the telescope. "I built kind of a checklist of the top 10 things that we need to worry about. By the time we got ready, it had 34 items on it," Good said during the panel discussion. "Number one was be safe. That always has to be the number one. Number two was don't break the Hubble." The complexity of the telescope, and the immense challenge of keeping it going for 25 years, is part of what Hubble will leave behind, Grunsfeld said. "Part of the legacy of Hubble Space Telescope program is that it was continually challenging very talented people. And that's when the really best traits of humanity come out: while working together to achieve things as a team that are just unbelievable," Grunsfeld said. "We had lots of independent review teams watching over us, and trying to make sure that we didn't do something that was unreasonable. Frequently, they came back and said that what we were trying to do was either impossible or a bridge too far. And we did all of those things and more. I think that's one of the legacies of Hubble is that it pushed people well beyond anything we imagined possible." To learn more about Intrepid Sea, Air and Space Museum's Hubble@25 exhibit, visit: www.intrepidmuseum.org/hubble@25.aspx.